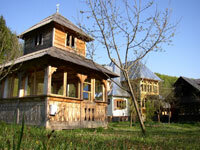 Our guest houses are now for over eight years, a magnet for visitors. They were built by Ruthenians, perhaps the true builders far and wide! The construction of the terrace and the second floor to be located above the main building (right photo), we have to thank them. In three separate holiday homes, you have rooms with double beds, bathroom with hot water shower and toilet and also have the opportunity to supply your own stove in spacious kitchens themselves. If you like, you can indulge yourself in agreement with us and gastronomically. Children stay up to three years in a guest house for free. 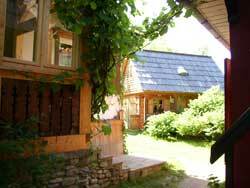 The houses are furnished in traditional style and equipped with the necessary utensils. 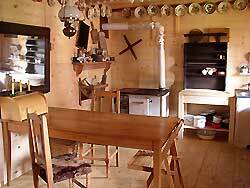 (Refrigerator, gas stove or electric stove plates, coffee machine, kettle, in the pavilion, you can see satellite TV, etc.) Also a washing machine they can use as needed for a fee. Fresh milk and real eggs guarantees them in the summer by appointment "Mama Buna," living within range of our grandmother. On their farm, they are still able to marvel at real rural life, which especially like the children of our guests. 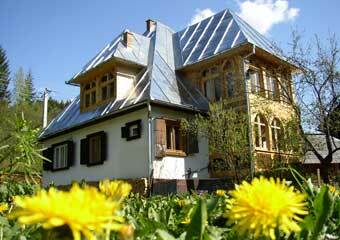 book (8 to 10h) to a secluded, Ruthenian mountain settlement. For up to 4 people, I'll take my SUV (Nissan Xtrail) day trips (about 8 hours) by the Maramures or run over at the Moldova monasteries (about 10 hours). 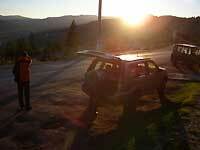 Find out more details can be found on the "Tours"
It is possible to rent the SUV. For this purpose, a separate reference is made below (right next to the price table). 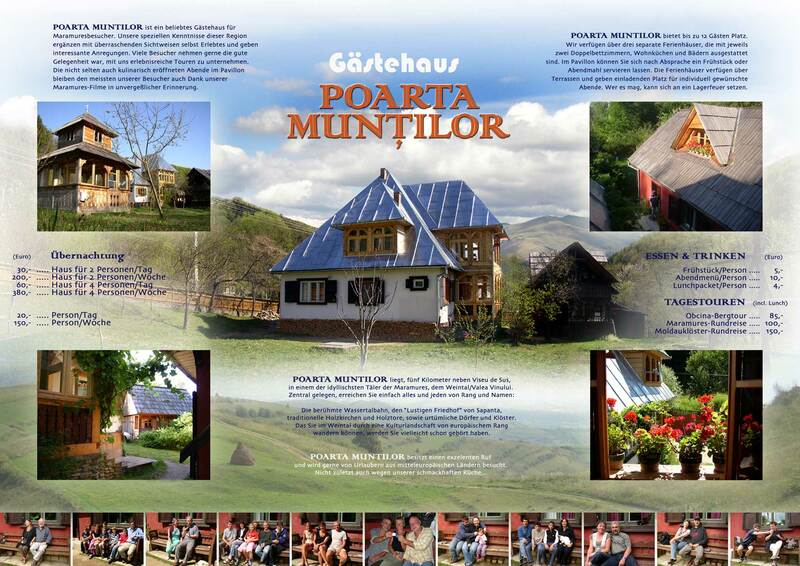 In the evening you can light a fire and barbecue, or watching from the Maramures Film Archive whim interesting documentaries on the Maramures, you can buy them too. 2. 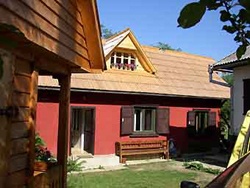 Red House: Apartment in a traditional style of the attic apartment: 2 rooms with double beds, cozy kitchen, small bathroom with toilet and sink (Note: The shower is located on the lower level), served up a spacious balcony terrace with unforgettable views the wine valley. 3. 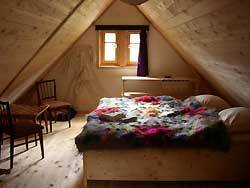 Wooden house apartment in a traditional wooden house on two levels (upgraded top floor), cooking facilities and a stylish gallery. Directly affiliated with a bath house with toilet and shower. All prices and contact details are shown below in a table. 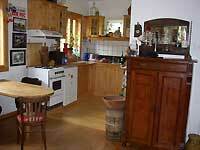 All houses are heated during the transitional spring and autumn periods. 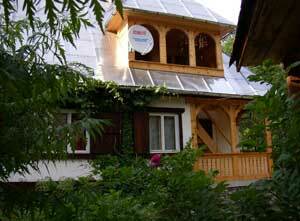 If it is necessary to heat up, we charge a extra charge per day from EUR 5, - In the two stone houses, you can also in winter (staying for a week) to spend a wonderful vacation. 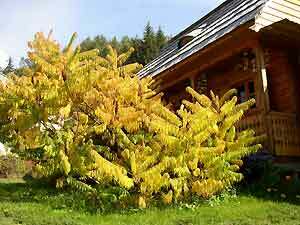 We recommend that you book your vacation in the summer months (June-September) to early, as the guest house known for years and have become very popular. 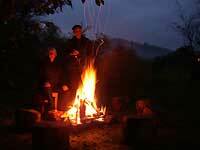 In our garden situated on a river you can - depending on your mood - for example, ignite a fire for grilling. 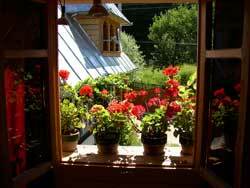 The view from the bedroom into the courtyard of the "Red House" "adjust" each year by Florentina lovely flowers. The "library" in the main house. Full of atmosphere this fine afternoon mood has banned a guest on image forever. 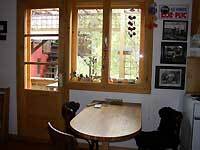 In the wooden house as well as in the "Red House" they live in a spacious and cozy attic. 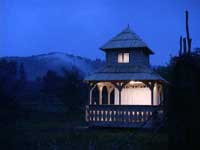 And because our guesthouse fortunately one of the most idyllic valleys lies the Maramures, we guarantee that the quiet and learn to appreciate a refreshing nights are pleasant. 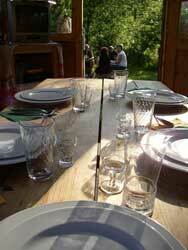 In the pavilion, it can be won early on, and dinner meals. Meanwhile, we have secured him with glass windows against the cold nights. 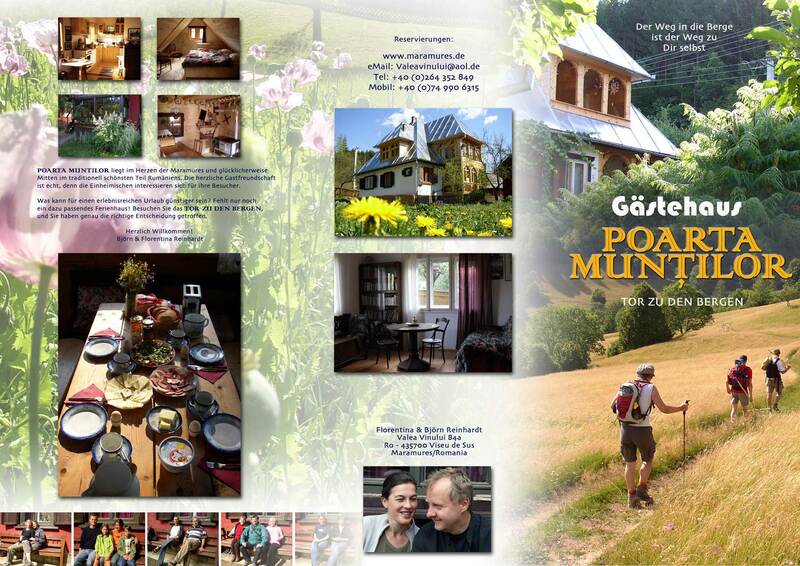 This is where our guests and yourself with cool Tuica and "Ursus" beer I show depending on the mood one of my Maramures documentaries. In the "big house" (the three images the Sun with each other) they are determined to make it comfortable in the nicely furnished living room. 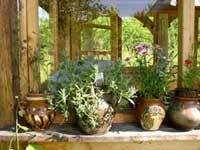 Immediately in front, you can also use a glass-enclosed terrace. The bedrooms are stylish. And they have like everywhere have a bath. Here to stay, our "Mama Buna," the grandmother of my wife. Your cow provides fresh milk daily and their chickens for eggs indescribably delicious that they make the breakfast a memorable experience. 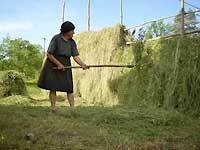 Their fresh scent of hay to dry them - as seen in this photo - from June next to the summer pavilion. 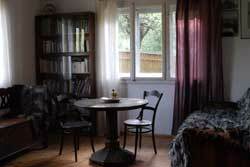 In autumn it is very nice in the guest house "Casa Björn & Florentina! The leaf color in the woods and in your own garden and the fabulous wealth mushroom (birch and wild mushrooms, Red Cap, Halimasch, etc.) 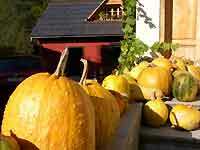 are very heart and soul ... pumpkins and then provide for culinary highlights. 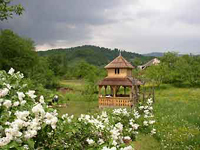 If you like, you can do a variety of interesting day trips in the Maramures across to the famous monasteries of Moldova. If they do arrive without a car or have their own cars are better, we offer them the opportunity to book guided tours of me (they look under tour packages). You can also off-road vehicle (Nissan XTRAIL) for hire by the day. Click on these buttons, and they can get a good idea of what to expect during the different seasons in the wine valley. Please order before your arrival and breakfast or dinner! If you feel like our kitchen, we ask that you first must give notice so we can be prepared. If you order should have regard to the arrival time understanding that our kitchen is open only to 20 clock.